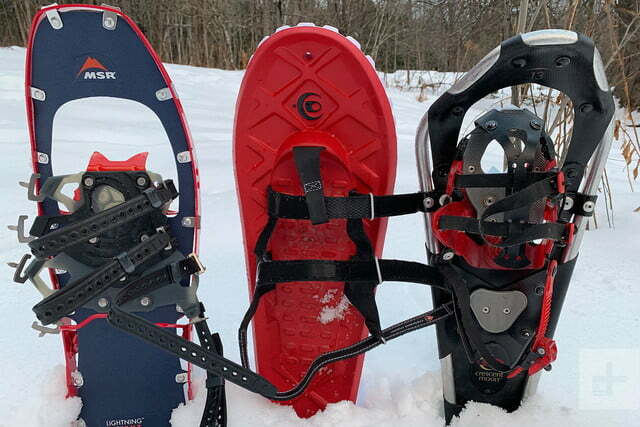 Crescent Moon has been making snowshoes for more than twenty years now, and has grown from a garage-based business to a world-class manufacturer and industry leader. 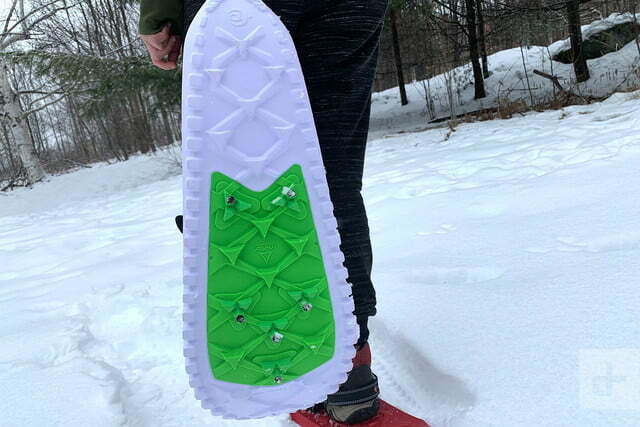 In 2017, the company surprised everyone when it strayed from its traditional aluminum snowshoes and debuted the Eva All-Foam snowshoe. Fast forward one year and the company is now selling a new and improved version (MSRP$180)– which we’ve been dying to try out ever since release day. 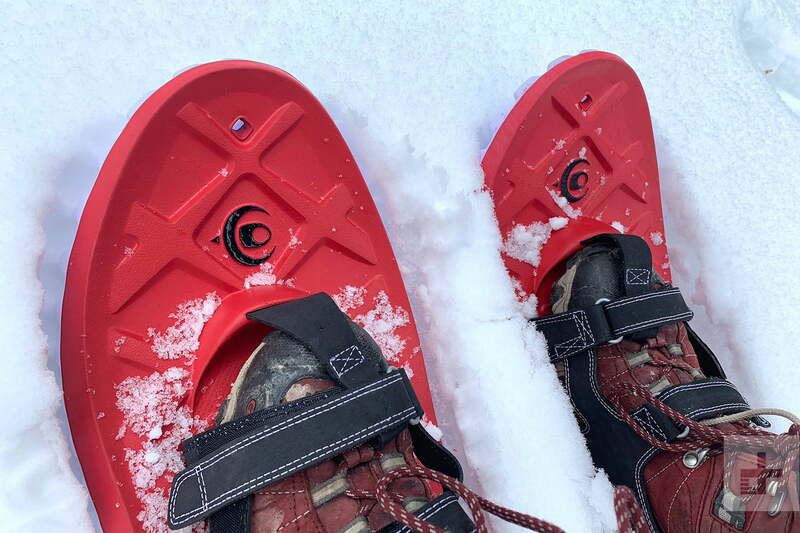 How does Crescent Moon’s latest foam snowshoe compare to the competition? We tested it in snowy Maine to find out. We have to admit that we were a bit skeptical when we first received this product. 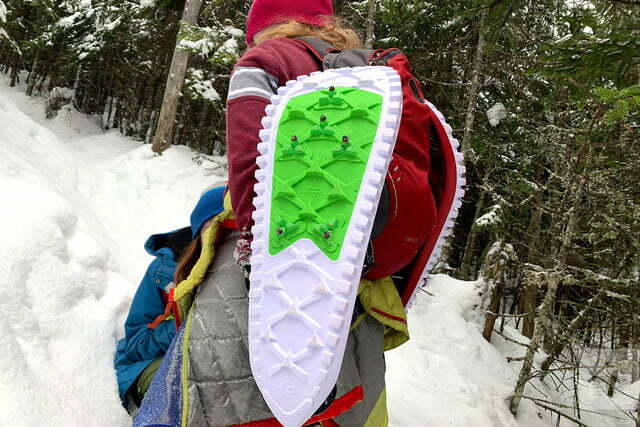 A foam snowshoe? A snowshoe without a pivoting binding? It goes against everything we knew about snowshoes, but all our doubts were cast away as soon as we opened the package. 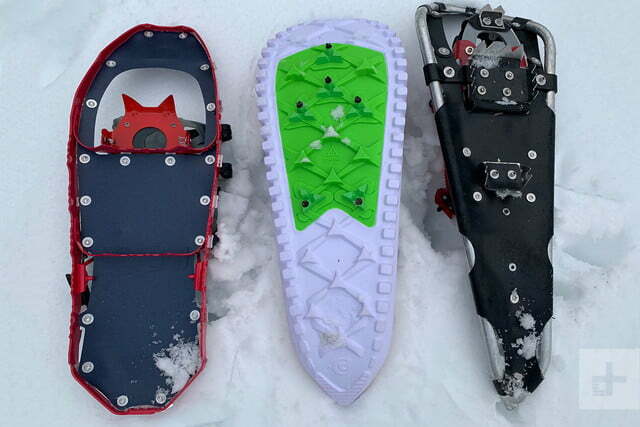 The first thing that struck us was that the Eva All-Foam V2 snowshoe is rock solid in its construction. 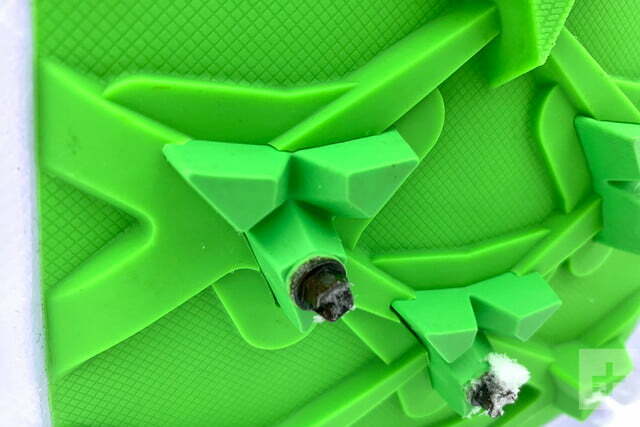 The foam deck is extremely durable, and the straps that hold in your boots are not only quite rugged, but also firmly embedded into the foam matrix so they won’t pull out if you snag your snowshoe on a branch or take an unexpected fall. The bottom of the deck is equally impressive, with a tire-tread like pattern on the bottom and studs for added grip. 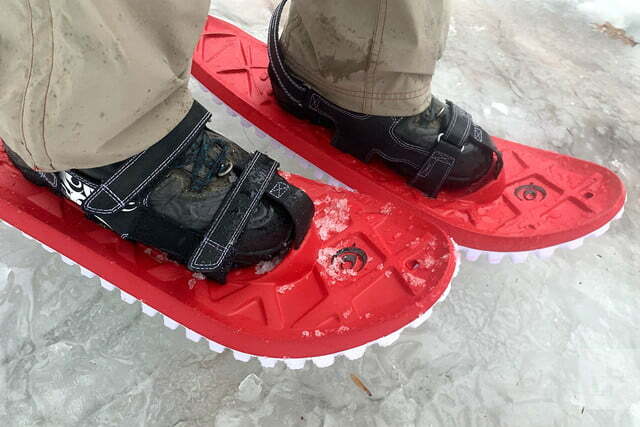 All in all, these are clearly well-built snowshoes. What really sets them apart from the rest of the pack, though, is their design. 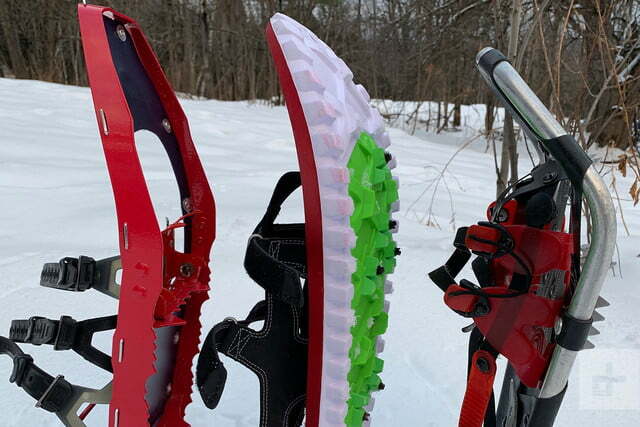 Most snowshoes are constructed with a rigid metal or composite plastic frame that doesn’t bend, and a hinged binding that pivots as you walk. Crescent Moon threw that paradigm out the window with these shoes and ditched the hinge entirely. Instead, the V2 models are designed with a pronounced upward curve in the deck, and a foam matrix that’s built to provide an optimal mix of rigidity and flexibility. It’s like they pulled the sole off of a running shoe designed for giants. They’re rigid enough that they don’t feel squishy, but also soft enough to bend and flex with every step. Walking in them feels like walking in your favorite sneakers. 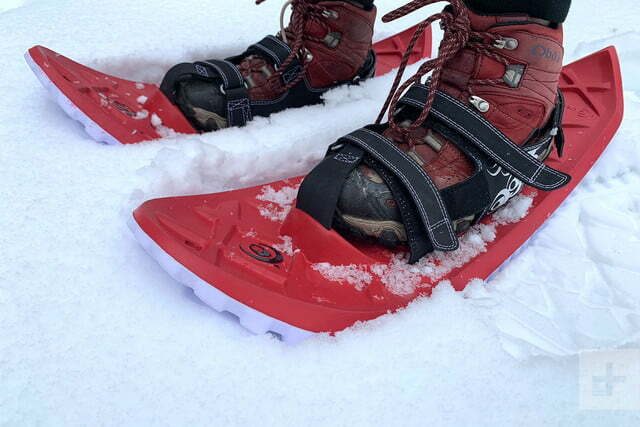 We were blown away on our first backcountry ramblings with the Eva All-Foam V2 snowshoe. The first thing we noticed was how light the foam actually is. 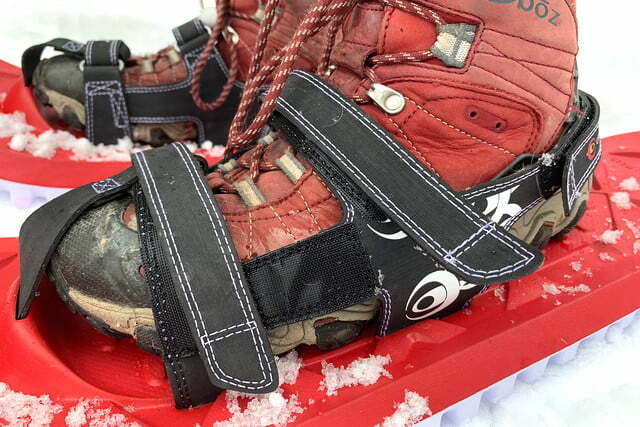 Most snowshoes feel brick-like when you wear them, but these are a notable exception. 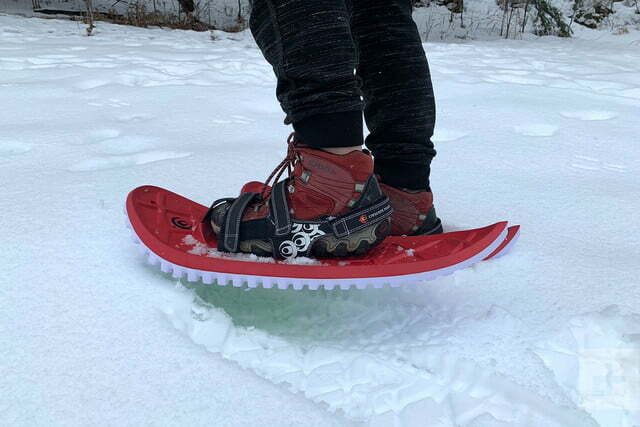 They feel incredibly light on your feet, and their tear-shaped design tapers the back of the snowshoe so you can walk with a natural gait and not the typical bow-legged waddle you’re forced to perform with traditional snowshoes. The velcro bind adjusts to fit a variety of shoe sizes and styles, holds securely and doesn’t slip. We also loved the binding system on these suckers. Crescent Moon is known for bindings that are easy to adjust and hold securely, and Thankfully, this tradition extends to the company’s new foam snowshoes. The Eva All-Foam V2 uses a velcro binding with two straps over the top of the foot, and one strap around the back of the foot. These straps are rubberized and rugged so you never have to worry about them breaking when you are five miles deep into the wood. They’re also quite versatile and can adjust to accommodate a range of boots and sneakers. In other words, these are the closest thing to a one-size-fits-all snowshoe that we’ve ever tried. 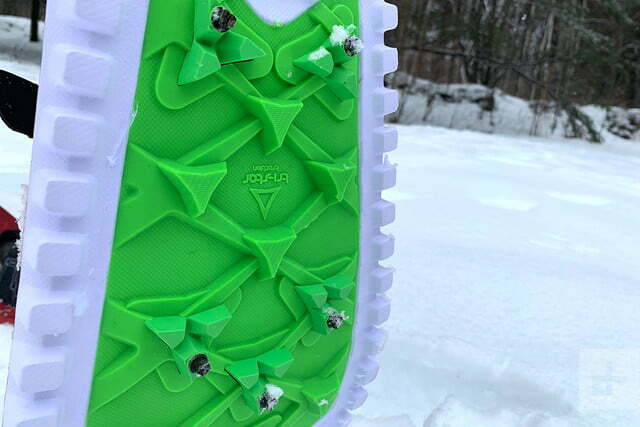 Thanks to an early winter in the Northeast, we had an opportunity to test the V2 shoes in both deep powder and hard-packed icy snow. In deep powder, they float enough that you’re not prone to “postholing,” but they also don’t float enough to let you cruise on top of the snow cover. 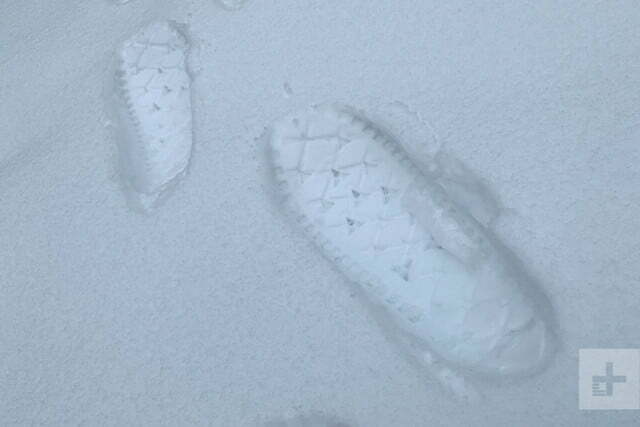 We sank down about 4-6 inches in a foot of powder, which is a reasonable depth for breaking new trail. Unfortunately, they are available in one size only (24 inches) and don’t accommodate tails, so you can’t improve their float by making them longer. They also tend to kick up snow in the back as you walk. 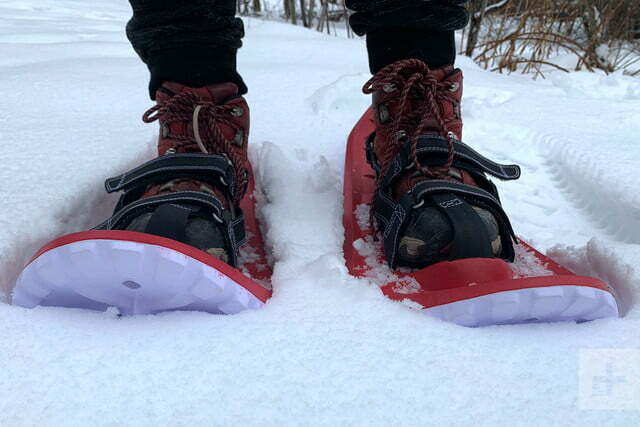 On ice and hard-packed snow, these snowshoes grip like champions thanks to the improved traction plates on the bottom of their decks. 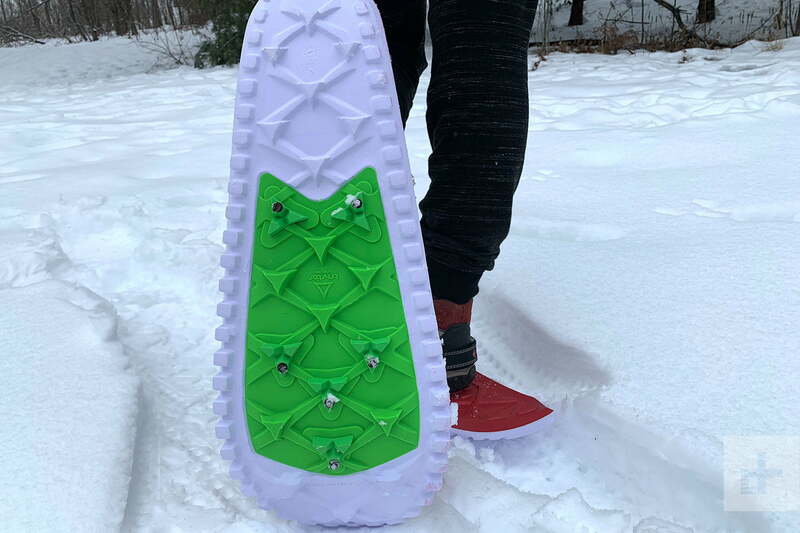 Unlike the original version of the Eva All-Foam snowshoes, which used only hardened plastic teeth for grips, this new version has traction plates with six rubber tri-star points, as well as replaceable metal ice spikes that provide outstanding grip. 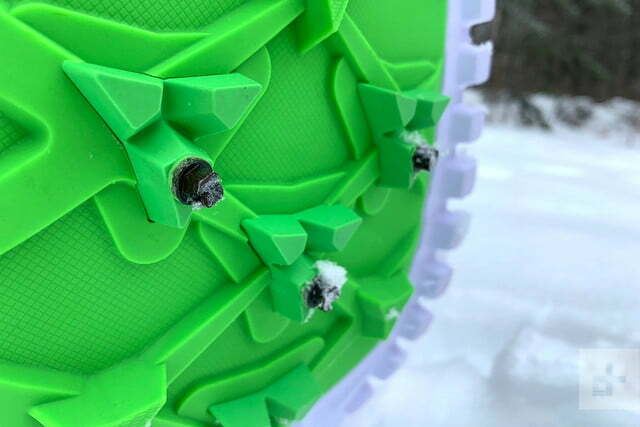 These studs dig into the ice and snow so you can skirt frozen streams and hike up icy inclines without fear of falling. 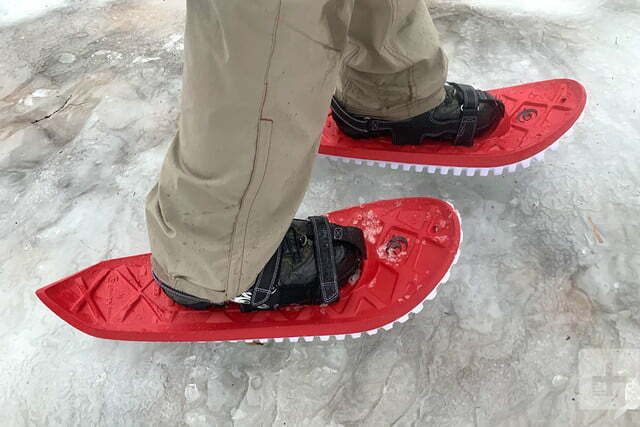 It’s worth noting, however, that while the traction plates work well on ice, the design of these snowshoes is not meant for mountain climbs. They are great for rolling hills and moderate inclines, but you shouldn’t expect them to perform well on steep ascents. 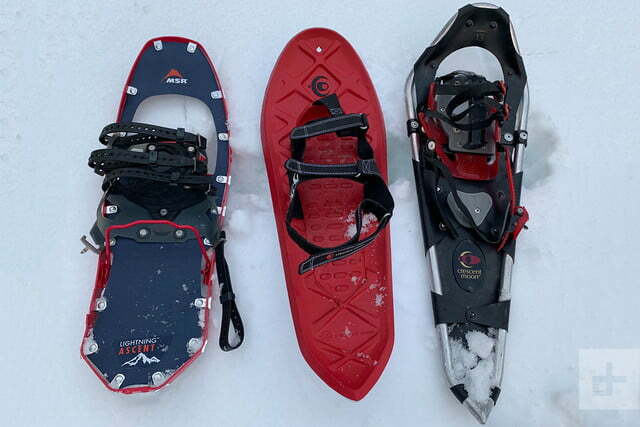 They don’t have the stiff, toothed side rails and deep cleats found on mountaineering snowshoes like the MSR Lightning or Evo Ascents. Crescent Moon’s Eva All-Foam V2 Snowshoe transforms the classic snowshoe into a winter walker you’re practically guaranteed to enjoy. Foam is a radical idea, but Crescent Moon pulls it off perfectly. The material cushions your feet when you walk, protects it from the cold, and flexes so you can walk with a natural gait. The snowshoes are also comfortable as hell, and only get better as you break them in. Just don’t expect to take them up Everest. 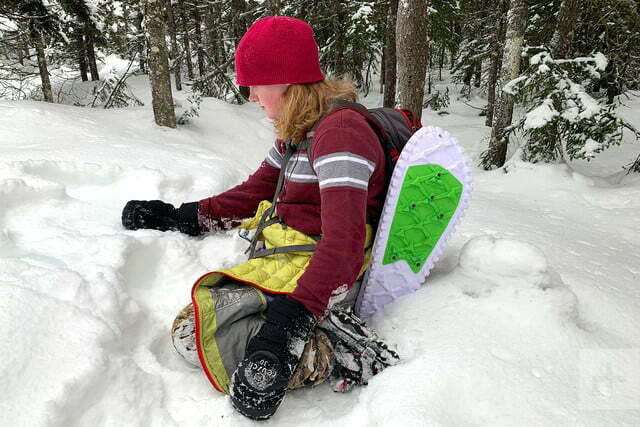 These snowshoes are ideal for recreational snowshoers, but won’t help you climb big mountains. As we mentioned before, they don’t have the rigid deck and deep cleats needed for mountaineering or high elevation winter hiking. For more technical excursions, we recommend MSR’s Lightning Ascents, which are rugged mountaineer snowshoes with toothed side rails for steep inclines. Also, despite the fact that they’re made of sneaker-like foam, the Crescent Moon All-Foam V2 snowshoes don’t excel as trail running snowshoes. They are longer and heavier than dedicated running snowshoes like those from Dion. The construction on the Eva All-Foam V2 Snowshoes is solid — just like Crescent Moon’s aluminum snowshoes. As long as you don’t abuse them, they should last for years. As a bonus, when they do reach the inevitable end of their life, you can recycle them at any location that recycles sneakers. Most definitely. These shoes are ideal for the recreational snowshoer, and are versatile and lightweight enough for both backcountry ramblings and trail walking. Because of their adjustable bindings, they’d make a great addition to a winter camp where you want a one-size-fits-all snowshoe.